Use gift cards purchased through FundScript to pay for your everyday items and help the animals. A percentage of the gift cards you purchase is donated to Animal Aid Foundation. Find gift cards for over 180 retailers on the FundScript website now. Buy from one of your favourite brands online and 40% of your purchase will go to Animal Aid Foundation. Visit the Tupperware website to start shopping for your favourite products. iGive.com makes it simple to help the animals. Every time you shop, a percentage of your total purchase amount is donated to Animal Aid Foundation. 1,304 socially responsible stores are helping to make donations happen. Renew your magazine subscription or order a new magazine subscription through Animal Aid Foundation and have your purchase generate a donation to help the animals. You'll receive up to 91% off newsstand prices and receive your first copy in 12 to 16 weeks. Why not buy everyone on your shopping list a subscription to their favorite magazine? 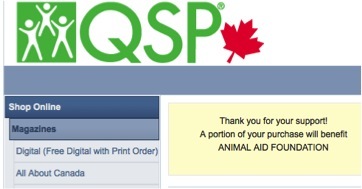 To renew your current subscription or to order a new magazine subscription, visit www.QSP.ca and enter our group number: 3741519 or search Animal Aid Foundation.